As I type this post and look out my window, thick snowflakes fall, covering the snowfall from last week. Another snow storm has arrived. Today marks the fourth day of cancelled school this winter. The anticipation and joy of receiving snow in December has given way to feelings of frustration and disgust. I am tired of wading through snow and trying to look professional while still staying warm. Walking across campus in these conditions is no longer fun. Yet even in my disgust over more winter weather, I am struck by the beauty of falling snow. Watching it swirl and fall to the ground, steadily and quickly, mesmerizes me. The outside world quiets and the landscape beyond my window takes on a new face. 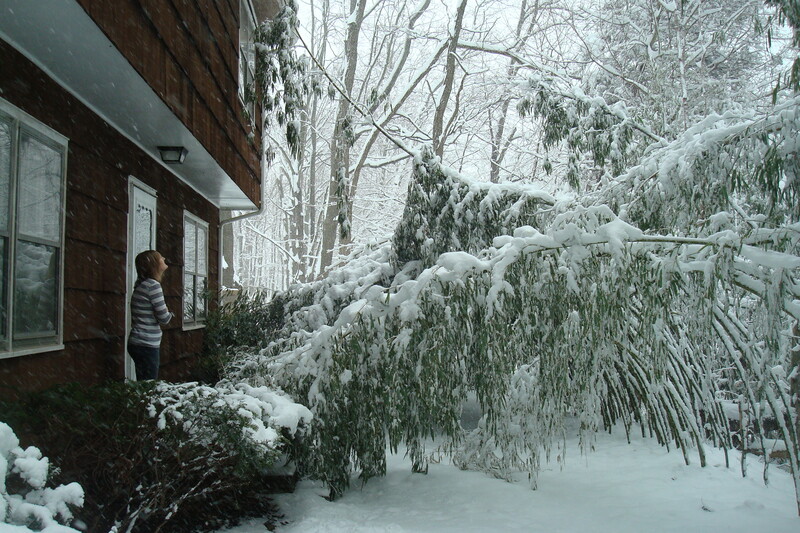 Last week’s snowfall brought a heavier snow, causing the bamboo outside our door to bend and bow under the weight. 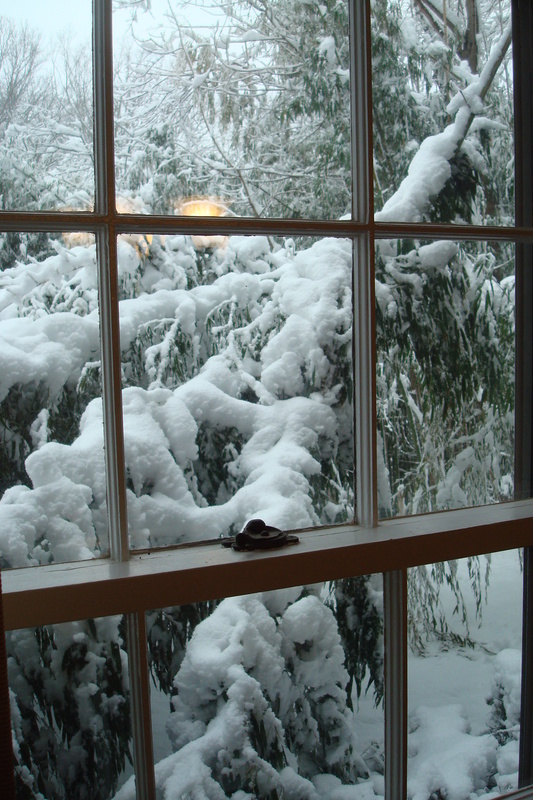 Today’s snowfall is a wet, heavy snow too, and I can hear the bamboo leaves scrape against the side of the house as the wind blows. I have a love/hate relationship with the bamboo. Bamboo does not lose its leaves in the winter, which means we enjoy a lovely blast of green all year long. It also serves as a “privacy fence,” hiding our house from the rest of campus. Yet, come spring and summer, the invasive underground root system kicks into overdrive, and if we are not careful, we can have bamboo shoots literally at our door. Snow storms also serve as reminders of the interrupted, unexpected nature of life. Plans shift. Expectations adjust. All in a moment’s notice. The challenge is to embrace the day that God has given, trusting in his sovereignty and timing. I need these snow storm reminders. So many days I go about my activities, blithely thinking I am in control of the day’s events. Like Job, I need to hear these words, “Can you loosen Orion’s belt? Can you bring forth the constellations in their seasons or lead out the Bear with its cubs? Do you know the laws of the heavens? Can you set up God’s dominion over the earth?” (Job 38: 31-33). Nope, I can’t. I will take this day, snow storm and all, and be grateful for the small, ordinary blessings of a warm house, hot coffee, and extra time to grade essays. Lovely! I appreciate your thoughts as I, too, am getting tired of winter. Our snow isn’t nearly as much as yours, I’m sure, but it’s definitely more than I’m used to. 🙂 Since I (thankfully) have no essays to grade, I will instead find more indoor activities for the wee-one and enjoy something hot to drink. Thanks for writing, Sarah. Looking forward to seeing you soon! Great reminder Alicia, thank you for sharing your thoughts! Hi Dar. Thanks for writing. Spring is coming!